Our senior high school cooperates with Savitaipale. We organize all kinds of events where we discuss mutual concerns and upcoming events, such as trips and parties. We take turns in organizing these get-togethers. 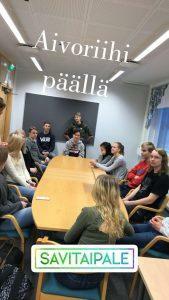 In these gatherings, student bodies from both schools have a meeting, while other students take part in various activities getting acquainted with the students from Savitaipale senior high school. The aim is to increase the overall cooperation between the two schools and have our first year students to network with each other. In the next meeting we will try to find ways to deepen the collaboration. As mentioned earlier, we also do trips to foreign countries with Savitaipale. So far, we have been to northern Italy with some senior students from Savitaipale. It has also become a habit to arrange a prom after-party. The party venue is situated halfway between our two villages, which makes it easily accessible to both parties. Besides, it’s a win win situation because we share the costs.